Opening Sentences: He stood out from the very beginning. Synopsis: !, surrounded by simple, ordinary, unassuming .s, stands out no matter what he does. He tries to scrunch up, he tries to stomp his long waving top into oblivion, but nothing helps. He doesn’t fit in with the others. Then, out of the silence of all those periods, a ? bounces in, full of questions. In dealing with all those non-stop questions, ! finds his own voice, and his own purpose. Activities/Resources: People who are younger than I may not be familiar with the pianist and comedian Victor Borge. He used to do a wonderfully funny routine called Phonetic Punctuation, in which he indicated all the punctuation in his speech with vocalized sounds. Children would have a great time doing this, either using his sounds, or making up their own to correspond with the different punctuation marks. Recordings of this routine are available on iTunes — search for Victor Borge and look in the list for Phonetic Punctuation. The blog Deceptively Educational has a printable board game about missing punctuation that looks like fun. 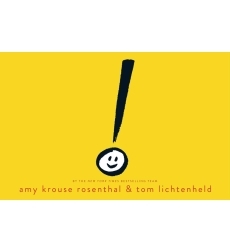 The blog The Educators’ Spin On It has an entire Amy Krouse Rosenthal virtual book club for kids. Scholastic’s website has an interview with Amy and the illustrator, Tom Lichtenheld. And here’s a link to the trailer, which will show you just what a delight this book is. I use ! a lot, too, Angela. I think you’d enjoy this book! Amy has written a very creative book! It’s entertaining but loads of fun! And Lichtenheld’s illustrations are perfect for the book. Excellent collaboration between Amy and Tom. Nice choice. Loads of fun, and a great message sneaked in. Thanks, Pat! GAH! I passed this book by an hour ago at the bookstore! I’ll catch it next time. We always played Punctuation Sounds when I was a teacher. The kids loved making up their own sounds for each mark. The exclamation point was the best! Genevieve, I love hearing that you played Punctuation Sounds with the kids in your class! You will love this book. Great find. Amy does come up with some cracking topics, which she so cleverly weaves into great picture books. She does indeed. What an incredible imagination that woman has! I use them a lot too. Great looking book. My husband talks about Victor’s routine often. Hilarious! I loved that Phonetic Punctuation! What a great book to go along with your new venture! I am all about exclamation marks! I’ll have to find this book! Thanks! You’re going to love this book, Rhythm! Thanks! I’ve been meaning to read ! !!! I like the trailer! WOO!!! This looks terrific, Beth. Proof once again that the team of Rosenthal and Lichtenheld can do no wrong! 🙂 All those rules you hear about not writing picture books about inanimate objects? AKR is my go-to example of how to make those stories work! Thanks so much for adding this one to our list! AKR is an amazing writer! Thanks, Susanna! I love anything Amy writes. She’s so original. Love this one as I use ! a lot, too. She’s incredible. This is yet another great book from her marvelous imagination. I’ve wanted to read this one. Thanks for all the links and ideas! You’re welcome! Enjoy the book! I read this over the summer. Outstanding choice! I was very surprised by its cleverness and originality. AKR is so good at coming at things from a totally different direction. Glad you enjoyed the book, too! I love all of her books! She’s a genius!